Not to be confused with the CFCA-FM station in Kitchener, this story covers the Original CFCA owned by the Toronto Star. The licence was dropped in 1933. When The Star covered the Canada Cup Yacht Races by a rapid wireless service back in August, 1903, it established the first use of wireless telegraphy in the history of Canadian journalism. Similarly when the rain-swept night of March 28th, 1922, carried The Star's first radio concert over Ontario, there was recorded the first use of the wireless telephone by a Canadian newspaper. It was pure experiment, that first radio concert. The public accepted The Star's invitation to crowd Masonic Temple to the doors; in Christie Street Military Hospital the auditorium was similarly packed; all over Ontario and New York individual receivers were tuned to The Star's wavelength, and the best artists in Toronto offered their services at the borrowed transmitting station of Canadian Independent Telephone Company on Wallace Avenue. But radio itself was an unknown quantity; the idea of a large audience listening to one magnified receiving set was daringly new; and rain and storm offered additional hazards. The experiment,, however, was a success. Congratulations poured in from all parts of Ontario, and The Star commenced immediate preparations for a broadcasting station in its own building. In the meantime arrangements were made for continued use of Canadian Independent Telephone Company's plant, and for weeks The Star attempted to satisfy the public demand in a series of nineteen public concerts broadcasted from C K C E and made available to the public without charge at gatherings in all parts of the city as well as being received by individuals within a three-hundred-mile circle. On Monday, April 10th, the concert demonstrations were supplemented by inauguration of a daily broadcasting service. This consisted of a thirty minute program each evening, giving political, financial and sporting bulletins prepared specially for, the radio service, a bedtime story for the kiddies, addresses prominent speakers, and popular music. At the same time a Radio Editor was appointed in charge of a radio department in the daily editions of The Star and a published service was established, comprising expert advice to amateurs as well as the latest and most accurate news of radio developments throughout the world. 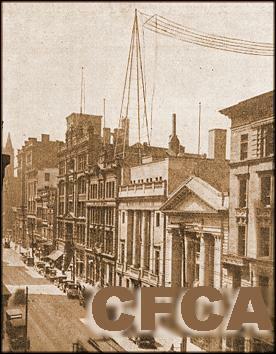 On June 22, 1922 after weeks of assembling and testing The Star's own radio station --CFCA-- was complete, and the first, service was broadcast from The Star building. 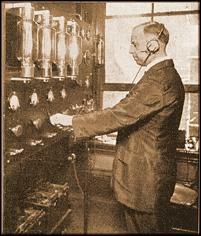 The new equipment, installed by Canadian Independent Telephone Company, under the supervision of Dr. Charles A. Culver is the most, up-to-date in Canada, and The Star's service was noticeably improved not only in the Increased range of 500 miles, but in quality of tone. The most recent additions to the service are The Star's travelling radio station and The Star's radio orchestra. The travelling radio station is a specially built closed truck equipped with coil aerial, receiving set and power amplifier. The " Star's " programs, broadcasted from C F C A in The Star building are thus received in the open air for the benefit of the public in outlying points. The radio orchestra is under the direction of Reginald Stewart, musical director of Hart House. It was organized for the, purpose of maintaining a high standard of music in the radio programs and has resulted in noticeable improvement, in the quality of The Star's service. With these additions The Star's station, CFCA, received appointment from the federal department of Marine and Fisheries as the Government's official bureau for the broadcasting of weather forecasts from the meteorological department. Keeping pace with addition to the service The Star's radio staff has been re-organized and expanded. At the present stage it consists of a Radio Editor, a program manager, two operators, an announcer, a secretary and a chauffeur, in addition to the orchestra staff. And behind CFCA's personnel stand all the resources of The Star's far-flung newsgathering organization.